Ellen M. Drolette has been working in the field of early care and education for 25 years. She has served on the board of the National Association for Family Child Care (NAFCC), is a Global Leader with the World Forum Foundation, and was named a Master Leader in 2016 by Exchange magazine. In addition to running her family child care program, Ellen has worked extensively with the new American and refugee community around early childhood education. Ellen and her business partner run Positive Spin, LLC, specializing in early childhood workforce development and capacity. 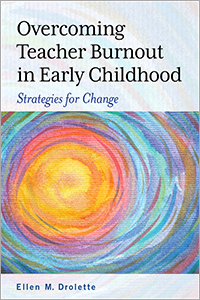 Personal stories from the field illustrate practical tips to refuel and improve morale in early childhood.